When sandwiched between magnetic materials known as ferromagnets, this topological insulator doped with chromium atoms conducts electricity on its surface and possesses desirable magnetic properties at a higher range of temperatures than previously possible. Image: Hanacek/NIST. This was clearly on display in a novel experiment at the US National Institute of Standards and Technology (NIST). This experiment was performed by a multi-institutional collaboration involving researchers from NIST, the University of California, Los Angeles (UCLA) and the Beijing Institute of Technology in China, and is reported in a paper in Nature Materials. TIs are a new class of materials that were discovered less than a decade ago after earlier theoretical work, recently recognized with the 2016 Nobel Prize in physics, predicted they could exist. These materials are electrical insulators on the inside, but conduct electricity on their outer surface. They are of great interest to computer designers because electric current travels along them without shedding heat, meaning components made from them could reduce the high heat production that plagues modern computers. They also might be harnessed one day in quantum computers, which would exploit less familiar properties of electrons, such as their spin, to make calculations in entirely new ways. When TIs conduct electricity, all of the electrons flowing in one direction have the same spin, a useful property that could be harnessed by quantum computer designers. One major problem, however, is the special properties that make TIs so exciting for technologists are usually observed only at very low temperatures, typically requiring liquid helium to cool the materials. Not only does this demand for extreme cold make TIs unlikely to find use in electronics until this problem is overcome, but it also makes it difficult to study them in the first place. Furthermore, making TIs magnetic is key to developing exciting new computing devices with them. But even getting them to the point where they can be magnetized is a laborious process. Two ways to do this have been to infuse, or ‘dope’, the TI with a small amount of magnetic metal and/or to stack thin layers of TI between alternating layers of a magnetic material known as a ferromagnet. However, increasing the doping to push the operating temperature higher disrupts the TI properties, while the alternate layers' more powerful magnetism can overwhelm the TIs, making them hard to study. To get around these problems, UCLA scientists tried using a different substance for the alternating layers: an antiferromagnet. Unlike conventional permanent magnets, whose atoms all have north poles that point in the same direction, the multilayered antiferromagnetic (AFM) materials have north poles pointing one way in one layer and the opposite way in the next layer. Because the magnetism of these layers cancels each other out, the overall AFM doesn't possess a net magnetism, although a single layer of its molecules does. It was the outermost layer of the AFM that the UCLA team hoped to exploit. In their experiments, they found that the outermost layer's influence magnetizes the TI, but without the overwhelming force that the previously-used magnetic materials would bring. And they found that the new approach allowed the TIs to become magnetic and demonstrate all of the TI's appealing properties at temperatures far above 77K (-196°C). Although this is still too cold for TIs to be used as consumer electronics components, it’s warm enough that scientists can use liquid nitrogen to cool them rather than liquid helium. 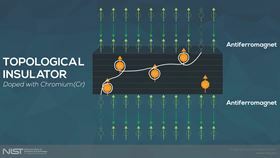 "It makes them far easier to study," explains Alex Grutter of the NIST Center for Neutron Research, which partnered with the UCLA scientists to clarify the interactions between the overall material's layers as well as its spin structure. "Not only can we explore TIs' properties more easily, but we're excited because to a physicist, finding one way to increase the operational temperature this dramatically suggests there might be other accessible ways to increase it again. Suddenly, room temperature TIs don't look as far out of reach."